You've played for so long and seen a lot. After so many long years, what does it mean to be honoured by some of the most respected cricket pundits in the world? It's always a great feeling. Doesn't matter how long you have played. When you are appreciated for something you have been able to achieve, it is a satisfying feeling. I remember the match in Cape Town. That morning session was an eventful one. I remember, I went in to bat on the second afternoon. I think just before tea I played an on-drive to Dale Steyn, and the way I positioned myself to play that shot, I knew I was moving well. That one shot gave me a lot of - you know, you need that kickstart for a big innings. That was the one which sort of put me in a frame of mind that I was seeing the ball well and getting a lot of time to react. From there on I built that innings. That eventful session on the third morning was one of the best sessions of my life in Test cricket. Morne Morkel was bowling to Gautam [Gambhir] at one end and at the other, Dale Steyn was bowling to me, and for 56 minutes or so the strike was not rotated at all. We scored runs in boundaries. It was quality fast bowling, and we had to give due respect to the seam movement and play out the session. That first hour was really enjoyable and challenging - something I will always remember. In terms of the challenge of conditions and bowling, Dale Steyn on that pitch, in that form - is that some of the toughest bowling you have faced? It is definitely one of the best spells I have faced. There was good movement off the seam, in the air. Dale Steyn moves the ball consistently. Also something that was alarming was the off-the-wicket movement. Even if you felt the ball was coming straight to you, off the wicket it was moving significantly. That was something one had to be aware of. Can you tell us a bit about the adjustments you had to make to get through the spell? I don't know. There is no one particular formula as such. I am a batsman who goes by the feel. If I feel like doing certain things, I just do them. In that particular innings, in the middle of my innings I felt I could stand outside the crease, and I did that. Just to cut the movement and bounce. And I felt comfortable doing that. Against any good, high-class seam or swing bowling, one needs to stay as still as possible and play as late as possible. Whatever the movements are, they need to be precise. Sometimes too many movements can complicate things, sometimes not moving enough can also get you in trouble. Whatever is needed to play the ball, only that much movement is important. That is what I was focusing on. "I am a batsman who goes by the feel. If I feel like doing certain things, I just do them. In that particular innings, in the middle of my innings I felt I could stand outside the crease, and I did that"
One thing we noticed, looking on from the outside, was that you were standing outside the crease, and you had just made up your mind that you were not going to play at anything outside the line of your head. I have covered for the ball that is coming in, and I am going to play just under what is my head. It is to do with sessions. There were certain shots which I felt I should not be playing in the first hour, and there were certain shots which I felt, maybe after that, I could go ahead and play them. If you observe that innings, there are certain shots I played around lunch time, and the same length deliveries I let them go in the morning. It is the freshness of the wicket in the morning. Just the first spell, as you expect, at that stage I felt that first spell was going to be decisive in which direction the Test match goes. Both of us survived that first spell. The important hour, as we say, we won that, I felt. It was an eventful one. We were beaten on occasions, but to actually be there and play out that spell was really important, which put us in a decent position. You were beaten on occasion, as you said. How important is to forget those balls? You are made to look a little ungainly, which you are not used to as a batsman. It's not one-way traffic. It's not that only the batsmen are supposed to go out and score runs. The bowlers are also supposed to get wickets. Sometimes we end up hitting brilliant shots, sometimes bowlers bowl brilliant balls. We have to respect that and forget about it and focus on the next ball. But also remember what the wicket has done, or what the ball has done off the wicket or in the air. Keep that in mind and focus on the next ball. Those two Dale Steyn spells. The morning spell and the one soon after lunch. Out of those ten overs - 60 balls - you faced 48. In the other 12 balls he caused havoc all around. He got Cheteshwar Pujara out, he got Dhoni out, and he could have got Harbhajan Singh out (the bail didn't fall). Was it a conscious thing to take most of the strike when Steyn bowled? Not really. Because I had batsmen on the other end. There is no conscious effort to do that when you have a proper batter at the other end. I guess that's the only reason I say it was an eventful session. The strike wasn't rotated. Fielders were pretty tight. Those quick singles were not available. Also, one had to play a little bit outside the line, which we did not want to do. Many balls were left. We got beaten. A few balls we managed to put away. What did you tell the batsmen at the other end? We were enjoying it. Gautam was at the other end, and we just said, this is a beautiful session, enjoy this challenge. On not many occasions do these things happen in your career. I remember a similar thing happening to me in Mumbai, when we played Australia [in 2001]. I was batting with Rahul [Dravid]. From one end Jason Gillespie bowled, and from the other end Glenn McGrath. And I played all the overs of Glenn McGrath, and Rahul played all the overs of Jason Gillespie. We hardly must have rotated strike. Similar situation, but those are the moments you never forget in life. This is definitely one of them. During this tense spell of play, there was a time when you shared a big laugh in the middle of the pitch with Harbhajan. What was that all about? Harbhajan walked in and he started to play like a proper batsman - wanting to move his feet and all that. And I said, "Don't do that. You need to play your shots and play whatever you feel like. Whenever you pick the line and length early enough, play your shots." Because he was looking to play like a batsman and it wasn't working for him. The moment he got back to normal Harbhajan Singh, he was able to play some big shots. That sort of disturbed the field setting, and that is what we wanted. We needed to score those crucial runs. Yes. It was an important partnership in the Test. We scored about 50-60 runs. Those runs were really important. There are different kinds of challenges in cricket. One is the occasion - for example, when playing Pakistan. Two is the match situation - you might down be four down for 30. But this was a pure cricketing conditions challenge. How different is the approach when you face these different challenges? There are different challenges as you go. Different oppositions. Different strengths and different stages. In the last 20 years that I have played, I have had oppositions that have had different strengths. You have to plan your strategy accordingly. The challenge here was to deal with the steep bounce of the Cape Town wicket. That wicket had spongy bounce. I wouldn't call it a fast wicket as such, but it really had steep bounce and lateral movement. That was one challenge we had to deal with. It's news to me. But I know that normally new years greet me well. Something nice. Good habit to get into. There are grounds and there are grounds. Newlands is a different setting. Table Mountain in the background. What does that do to a player? Does it inspire or distract? It helps when you have had a long day's fielding. You look at the mountain and appreciate the beauty. Nature has done something absolutely fabulous. Otherwise you are focused so much on the game you don't notice all those things. Only when you have long fielding days. That's when you look at these things. When batting through these tough sessions, do you not notice anything else? Are you in the zone? Not really. No, no, you notice all that, but there is not much time. You are constantly focusing and thinking also, even when on the non-striker's end, thinking what the other batsman should be doing. As a non-striker, I like to make observations. If I feel that there are areas where he has to be cautious, or where he is really doing well, share that with him and tell him, "You have been batting brilliantly. Just continue." Sometimes you feel a player needs to change his game or tighten up a bit. As a non-striker you are making those observations. Sometimes in between overs, or after the over, you are constantly exchanging opinions. Your views. That becomes critical in a partnership. 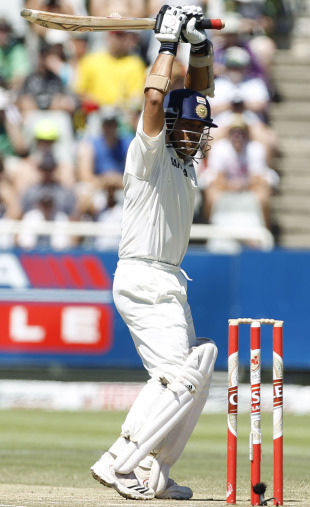 Any interesting observations you remember from the innings, with, say, Gautam? I thought we were really going well. All we needed that time was for the non-striker to come and say, "This is perfect. Continue. Keep it tight. Don't play loose shots." Which is normal in partnerships. Let the non-striker know what you think of that particular over. Or if he is in any doubt, or if I am in any doubt - we discuss all those things. Of late we don't see such innings where the batsman goes through sessions with such disciplined cricket. Batsmen nowadays feel the need to find a release. A boundary from somewhere. How difficult has it become to bat through sessions without finding that release? As you said, the singles were not available, and the boundaries were few and far between. There were boundaries. First over, Dale Steyn. Bowled brilliant balls but I managed to hit boundaries. It is about when you feel you should be able to press the pedal. And counterattack occasionally. Sometimes you need to respect that particular spell. "Somebody sitting in the stands or in the commentator's box wants me to hit a boundary. Why should I do it? I have to score runs, I need to make my decisions. You have to play according to what you feel. That's what you have been picked for"
It's also to do with how well a batsman is moving. What is his frame of mind? It is not about repeating the same thing every day. There are times when a batsman feels he is not moving well enough to take charge. And there are times when you feel, "I need not do this. I am in control. Why should I just do it for the heck of it?" Somebody sitting in the stands or in the commentator's box wants me to hit a boundary. Why should I do it? I have to score runs, I need to make my decisions. As long as you are confident of your own decision and your gameplan, it is fine. You cannot keep 25 people happy in one innings. You can't have 25 different shots for one ball. You have to play according to what you feel. That's what you have been picked for. Did you target any of the bowlers for runs? Not really. That wasn't the kind of surface where you could target someone. There was constantly something happening. So it was more a case of the wicket losing some of its freshness towards lunch? And also, you know, the bowlers… the first spell and the second spell are not the same. After the day's play, Dale Steyn said in the press conference that bowling to Sachin Tendulkar when he is batting like this is a waste of time. It's better trying to take somebody else's wicket. After the game did you and Dale chat about that day's play? No, we didn't. I am hearing his reaction for the first time, from you. But my reaction would be the same. It was fantastic playing against him. I had to respect him for what he was doing. Somebody is bowling well, you have to respect it. You try to be over-smart, you go back to the dressing room. Does facing bowlers like Dale Steyn... and there was also Jacques Kallis, who scored a century in the first innings despite the rib trouble, and he would go on to score another. Does facing these players spur you to give a little extra on occasion? No. It's not between two individuals, it's between the two nations. I play for India. It's not what an individual feels. It's about what an individual can bring to his team. That is more important. When we walked out of Newlands that day, most of us felt we had seen the best day's cricket we had in a long time. Did you as players feel that it was one of the best days of cricket you had been in? I didn't share much with my team-mates. But definitely, looking at Gautam's reaction, we both felt the same. That this is one of the best sessions that we have been part of.